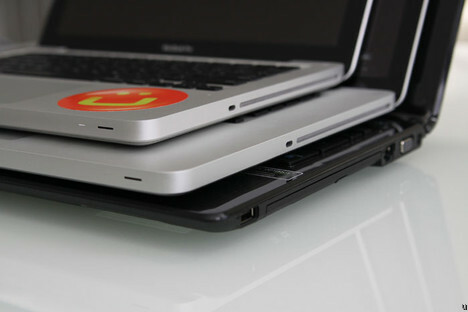 Apple has recently upgraded its Macbook Pro line of laptops. Among the most noticeable improvements, there's the Intel Core i5/Core i7 Processor (CPU), the discreet Nvidia GT 330M graphics processor (GPU) and an even longer battery life (increased by 1hr to 3hrs, according to Apple -depending on the model). The old Macbook Pro laptops have been removed from the shelves, so there is little point in spending too much time comparing. This review might be most useful to very old Macbook owners, potential first-time Mac Buyers who wonder which Macbook Pro they should get (13, 15 or 17). We have not forgotten Windows users who could be lured by the great aluminum industrial design, so we will tell you how it behaves under Windows 7 and what's in it for you. In this review, we will use the Macbook Pro 15.4" with Core i7 and we will compare it with its peers. Ready? Context: We all use laptops for different purposes, so before you dive into this review, let me tell you where I come from: I mainly use laptops for productivity use (writing, email, browsing, light image resizing). Some gaming from time to time doesn't hurt, but this is not a priority. "Productivity use" means MS Office (Outlook, Word) and lots of web (Firefox, Chrome). I try to use my laptop as a companion computer only (I have a beefy desktop PC), so I don't have all my media files (music, videos, photos) in there, which is why I have plenty of storage left on the hard drive. In the past two years, I have used a Sony Vaio SZ , a Sony Vaio SR and a Macbook Pro 13" (year 2009, on Windows 7) as work laptops -- yes, I'm a "PC" guy too. I often use Mac OS X for my personal stuff, but most of the tools that I work with run on Windows. From this review, I hope that you can extrapolate what your experience of the 15" Macbook Pro (Spring 2010) would be like. Build quality (Excellent): Most of you are probably familiar with the Apple Unibodydesign, which is carved from a solid bloc of aluminum. However, if you have not held a Macbook Pro in your hand, you might not know how ultra-rigid the Unibody frame is. I tried the magnesium and carbon-fiber casing, and I can tell you that this feels much more solid. It gives a very reassuring feel when holding it. 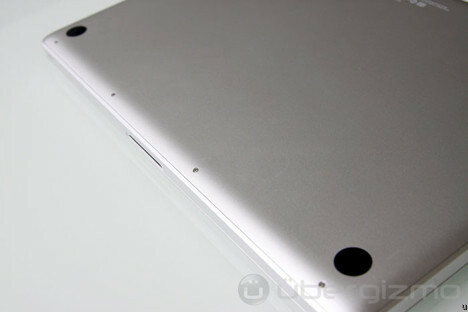 My worst fear is to actually scratch the aluminum surface (I have an invisishield on my MBP 13). I think that pretty much everyone agrees that the build quality of the Macbook Pro line is quite spectacular - most of the debate is usually geared towards whether or not this is "worth" it. Weight (Average): at 5.56lbs, it feels relatively heavy (more than it looks), but that weight is pretty common for laptops of that size. 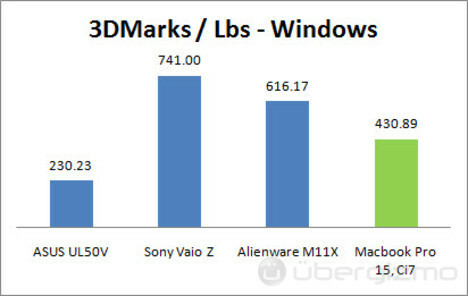 For reference, the Dell Studio 15weighs 5.54lbs and the HP Pavilion dv6t Quad Edition reaches 6.34lbs. Both PC competitors are powered by a Core i7 CPU. I have recently reviewed the Sony Vaio Z (read our Vaio Z review) that offers a similar raw performance to this Macbook Pro 15", at only 3lbs (! ), we'll get back to that later. For reference, the Macbook Pro 13 weights 4.5lbs and the 17" weighs 6.6lbs. Size: visually, the Macbook Pro 15 is not that much bigger than the Macbook Pro 13 but, you will *perceive* the 15.4" Macbook as being significantly bigger than the 13.3" on your lap. This is something to consider when choosing between both. Note that many 15" laptops, like the ASUS UL50, are slightly bigger than the Macbook Pro. Comfort (Good) : Also, despite the small size difference, I found the 15" to be significantly more comfortable to work with than my Macbook Pro 13". More of my forearm can rest on the laptop, so I don't feel the pinch of the relatively sharp edges on my wrists - don't laugh, they are sharp! That said, the 13" might be easier to manage in small spaces like planes or crowded conferences. It would be only fair to say that weight is also a factor in the overall "comfort", so you will have to figure out if you you want to prioritize the "carrying" part, or the "working with" part, but with a difference of only 1lbs, I'd say that the "price" part might prevail. Display: The display size also plays a major role in the overall user experience, mainly because it often lets you "see more" things on your desktop. The display quality is very good, and I like the fact that the light distribution is even for all practical viewing angles. The Macbook Pro 15" comes by default with a resolution of 1440x900 and a glossy screen - this is the only version that you can get in an Apple Store. As an option, you can custom-order a 1680x1050 "high-res" screen with glossy or anti-glare finish. The latter is my favorite and my recommendation, assuming that you have a good sight. If Apple could add a 1920x1200 option, that would be fantastic. Update: I finally had the time to compare the standard glossy display to the "hi-res, non-glossy" one. The verdict: I love the extra resolution. The anti-glare surface works, but colors aren't as nice (they don't "pop" as much). Now it's your choice. What about the 17" Macbook Pro? 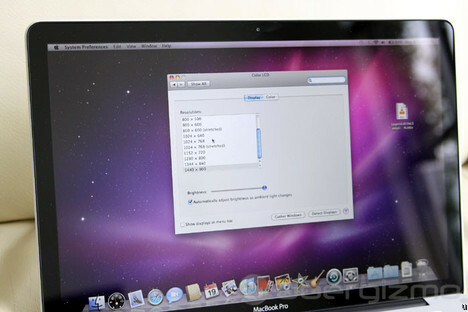 : The 17" is even bigger, but it is not faster than the fastest 15" Macbook Pro. The 17" is all about the screen real estate (1920x1200) and expansion slots (3xUSB, ExpressCard/34). I tend to see the 17" as a mobile workstation, and this is clearly not something that I want to move around everyday, although some people do it and be OK with that. 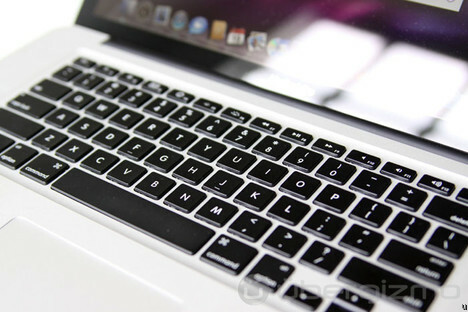 Keyboard: The Macbook Pro familly has a backlit chiclet keyboard design. The travel space (depth) is fits my typing well and the spacing lets me type comfortably without being cramped or without having to move my hands more than they need to. Keyboards are one of those things that many people often overlook or assume that "they're all the same". As someone who types a lot, I pay more attention to it than others, but I tend to like Apple Macbook Pro keyboards better (the Apple desktp keyboards don't match the quality of their laptop ones). Closely behind, you will find the HP Envy and the Vaio Family (Z, SR). Of course, Macbooks are known for their backlit keyboards (activated manually or automatically by a light sensor). Depending on where you work, this can be pretty handy. Dell is one of the rare manufacturers to offer this on many of their products. Computer makers often considers backlit keyboards to be a "luxury" option. This costs $25 to add (according to Dell.com), and it's a much better upgrade than many of the silly things that are proposed to customers (fancy sound card, fancy Bluetooth). 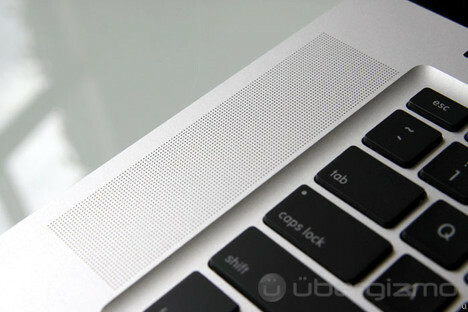 Trackpad (Excellent): The trackpads on the Macbook Pro line of product have to be the biggest trackpads out there. 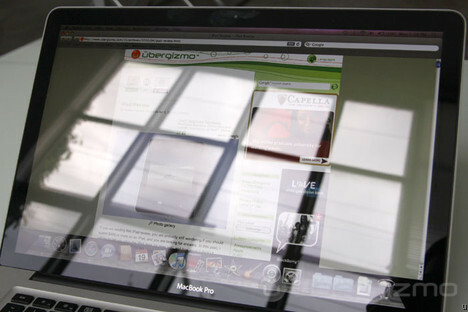 The good thing about them is that they use a glass surface, while most laptops have a plastic surface. 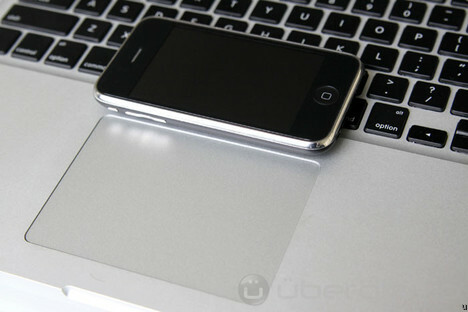 The glass trackpad is very smooth and your fingers basically slide much more easily and comfortably than on a plastic pad. Also, Apple made it really big because there are many multi-touch gestures available - some on Windows too. There are no apparent buttons, but the whole surface can be clicked on (it is a real mechanical clic), and you can also set zones (like lower-right = right click). To conclude on the trackpad, I'll point out that Apple has implemented multi-touch, but also an inertial scrolling that makes the Macbook behave like an iPhone when scrolling up and down. Audio (Ok, but soft): Thanks to the speakers on either side of the keyboard, the Macbook Pro 15 has a very decent sound - much better than the 13" version which has its speakers in a less convenient spot. In a quiet environment, the MBP 15 sound is sufficient but not loud.In a noisy environment, you might a hard time to hear. The speakers placement is much better than the MBP 13"
Charger (Compact): The Macbook Pro 15" comes with a 85W power supply. It works just like any other power supply, except for two important details: 1/ if you don't use the extension cord, you can wrap it neatly. 2/ The MagSafe power connector snaps-in with a magnet. If someone trips on your power cable, the laptop won't take a direct trip to the floor. To be honest, no-one has ever tripped on my cord, but I really like to have the cable neatly packed. 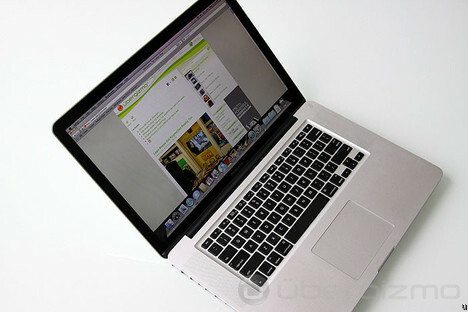 This Macbook Pro 15 uses one of the fastest Intel processor available for laptops: the Core i7 620M at 2.66Ghz. It has the particularity to be able to raise its frequency to 3.33Ghz if there's more work to get done - this is also great to accelerate single-threaded applications that don't use all the computing cores. The 3.33Ghz frequency can only be sustained as long as the system does not get too hot. The system also benefits from a better graphics processor (GPU) than the one available last year for the Macbook Pro line. The Nvidia Geforce GT 330M works great, but falls a little short for demanding games. 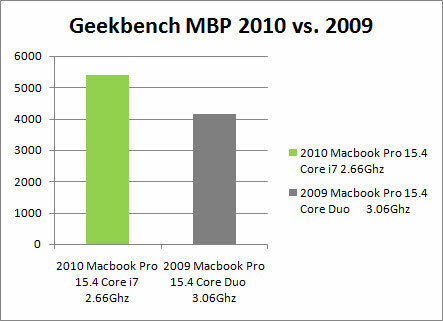 Processor: The raw processing performance numbers form Geekbench alreadyshow a 30% to 50% increase when compared to the 2009 Macbook Pros. This gap will be reflected in multi-thread friendly applications like video compression, music encoding or and 3D (offline) rendering. Other applications will benefit from the 3.33Ghz peak frequency. Graphics: The GeForce 330M graphics processor (GPU) in our Macbook Pro 15" has 48 computing cores, a good increase from the 32 cores (GF 9600M) or the 16 cores (GF 9400M) from previous Macbook Pros. You will get graphics performance improvements as high as100%, depending on which 2009 Macbook Pro you compare it with. That said, I don't consider the GeForce 330M to be sufficient to play the latest games. Instead it will let you play last-gen games comfortably. Applications like Photoshop CS4 will benefit from having a graphics processor, but could use 512MB of graphics memory. 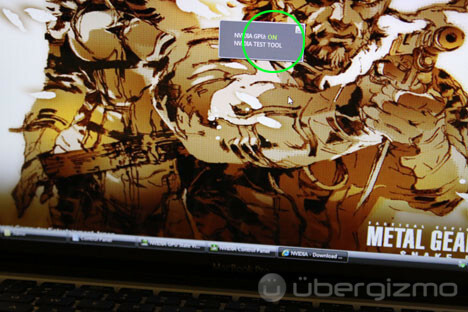 Note that the new Macbook Pro 13" is equipped with a GeForce 320M, a chip that Nvidia is providing only to Apple. The gaming performance improvement lands anywhere between 30% to 80% depending on the game (when compared to the GF 9400M). All Macbook Pro graphics processors also support a general purpose computing mode (via OpenCL) that can be used to accelerate video or music encoding, among other things. Temperature: This Core i7 Macbook Pro can go from cold to the touch, to warm, to very hot depending on your activity. 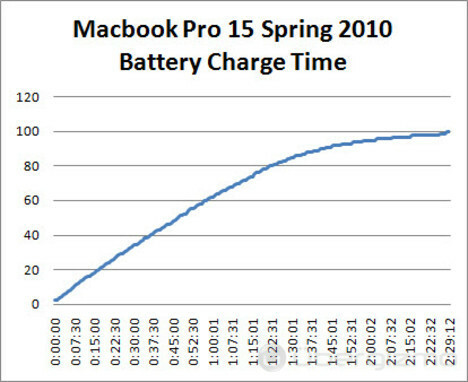 On battery (low-power mode), the Macbook Pro stays cool. when plugged to a power source, it gets hotter and becomes warm (38 degrees C). Under load (3D games...), it becomes very hot - to the point that I don't want to leave my hand onto the back surface. Noise level: When the computer is cold and warm, there's no active cooling (at least, not that i can hear). During an intense activity, two internal fans will kick in to cool the CPU and GPU. The Macbook Pro then becomes very noisy. 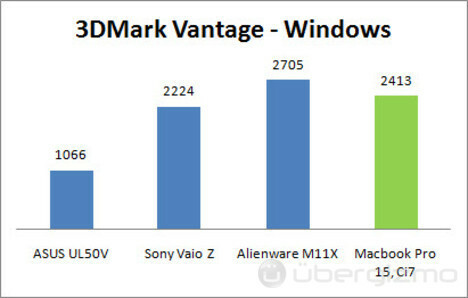 Windows Benchmarks: although you might never use Windows, I found that benchmarking hardware speed was fairly accurate under Windows (that's where all the fancy benchmarks are), so I'm throwing in a few numbers and comparisons with a few laptops that I had in my hands recently. The comparisons aren't here to tell you which is "better", but to give you an idea of where the MBP 15 (Spring 2010) stands in comparison to other hardware configurations on the market. 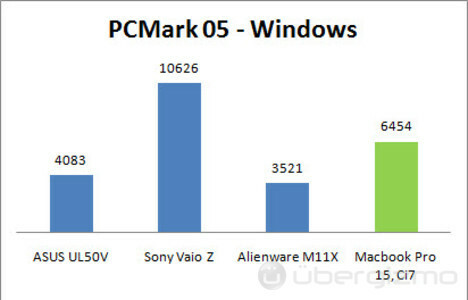 PCMark05 aims to measure the overall system performance. The Vaio Z does very well, thanks to its SSD. The new Macbook Pro series comes with slightly higher capacity batteries, but this is partly there to offset the slightly higher power consumption elsewhere in the system (esp. for the 15" and 17" models). In the end, we're more or less where we were before last year when Apple introduced its new powerful batteries. Idle power measurement is important to consider because it basically defines a fictitious "best case scenario" that can be used as a baseline. Also, when you perform a low-intensity activity like typing text, or reading a document, the computer state is very close to "idle". Battery charge time: 2h29mn. This is fast. 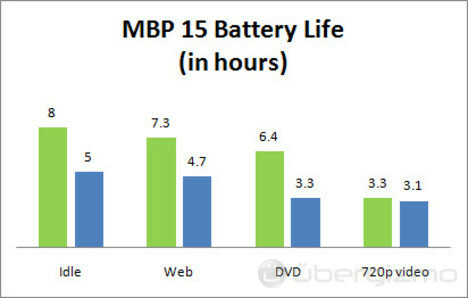 For example, the new Vaio Z takes 3hrs to complete a charge on a 57Wh battery, versus the 77.5Wh of this laptop. Also, it takes the Vaio Z 1h50mn to get to a 80% charge. The Macbook Pro does it in 1h20mn. The battery life under Mac OS X is excellent, and you will be hard pressed to find anything better with this kind of processing power under the hood, in such a slick package. As you can see, the battery life in Windows is much shorter. Despite fixing some obvious Windows Power management problems, like fixing display brightness (always too bright) and the keyboard backlight (coud not turn off), Apple's drivers still aren't providing a normal level of power management for the Windows Platform. For instance, the powerful discrete GPU is always ON in Windows (7, vista) and Bluetooth seems to be on - even if you disable the Bluetooth device in the device manager... I can only imagine what else goes on in there. The Sony Vaio Z, which is arguably one of the closest PC Hardware equivalent gets a much better battery while using a less powerful battery 57Wh (Vaio Z) versus 77.5Wh (Macbook Pro 15). Even the presence of an SSD in the Vaio Z cannot justify the difference in battery life, and I'm just about sure that there is much work that needs to be done in the drivers. Whatever the reason, the fact remains: if you want to use Windows with Boot Camp, you will not completely benefit from Macbook Pro's fantastic battery (that you paid for). I also tested Windows in emulation within Mac OS (with Parallels): in idle mode, it gets a better battery life than when running with BootCamp (about 1hr more in idle mode), but as the tasks become more intensive (even web browsing with a bunch of tabs), the gains go away and turn into a loss. The system will also be less responsive in general. The sad part is that even though the battery life is crippled, it is still better than most PC laptops with similar processor and graphics.That's because none of them have a super-large capacity battery built-in that is powerful enough to offset the effects of a poor power management. In addition to that, many use the Intel Core i7 Q720M, which consumes noticeably more power than the 620M found in this Macbook Pro. but it is intimidating enough to discourage many. The Unibody design is not very friendly for newbies who want to replace parts themselves. It is possible, but not really recommended, especially if you are not used to touch the guts of your computer. Try to make up your mind before buying it. Extended Battery (or the lack of): You can't buy an extended battery for a Macbook Pro, but there's always the HyperMac solution. 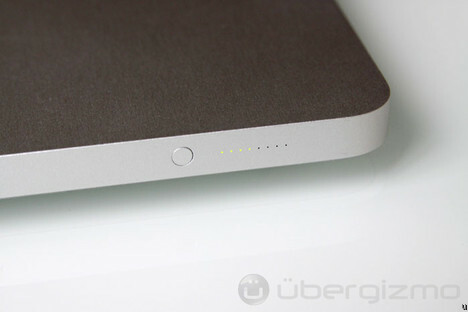 These are external batteries that connect to the MagSafe power connector. From your mac's point of view, it is as if it was plugged to a wall. There are many capacities, but the basic one usually double your battery life. 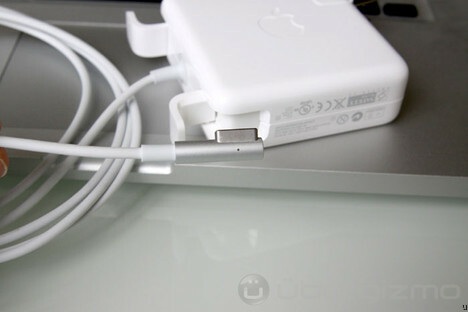 HyperMac also has a USB port, which can be used to charge other devices via USB. 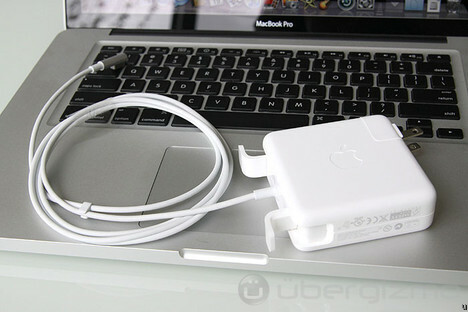 HyperMac products then to be expensive ($200-$300 to $500) because in order to build them, HyperShop has to buy an Apple Power Adapter, just to cut out the MagSafe connector that Apple does not license to 3rd parties. 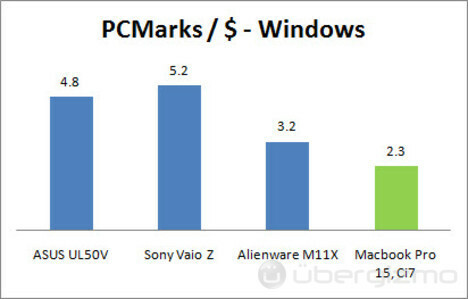 That said, many "standard" laptop batteries already cost $199 (Vaio...). HDD/Memory: If you are willing to open your Macbook, you can upgrade the memory modules yourself. It's not for everyone, but you could upgrade to 6GB of RAM (2GB + 4GB) or replace the hard drive yourself for a larger one, or for a Solid State Drive (SSD). I'm not sure what Apple's policy is with replacing parts, so with might want to check it out - just to make sure that your warranty won't be lost. Building a fast computer isn't hard if it is a power hog, building a light computer isn't hard if it is weak, and building a nice computer isn't hard if it's expensive (well, may be it is...). In the end, it's about how design, speed, and price are combined, and balanced, to create a product. In this section, I'm trying to give you a sense of what you are getting for each dollar spent and each pound (of weight) added to the design. You should not take this as Win or Lose contest. Instead, think of it as a guide that shows you what each dollar and each pound give you, only in terms of performance. The design and usability are completely left out in this paragraph. This shows how much graphics perf. you get per pound. The Vaio Z wins (hands-on) mainly because it is much lighter. This shows how much overall system performance each dollar buys you. Graphics: The GeForce 330M is a great improvement over the 9600M, but it falls a little short when it comes to playing with recent games. The GeForce 335M consumes more power, so I understand why Apple stayed away from it, but gaming capabilities is one of the things that could be improved to make this computer a perfect laptop. Plus, Apple has a graphics auto-switch, so is it such a big deal to have a more powerful GPU? 1080p display option: it would be just great if there was a 1080p option, and in my opinion, the default resolution should be 1680x1050. Blu-Ray: the Macbook Pro 15" might not have a wide screen, but it would be a great platform to watch Blu-Ray movies all full 1080p resolution on an external screen or at 1080x1050 on the LCD panel. No 6GB memory option: 6GB is really a sweet spot, and given how expensive the 8GB memory extension is ($400), I wished that Apple would have a 4GB+2GB option at order-time. Which Macbook Pro should you get? 1/ If you need a little more screen real estate, go for the 15" - it is great to serve as a main workhorse and it could easily be your main computer. 2/ For a mobile companion, the 13" is usually great, if you don't work on it for hours at a time (like 3+ hours). The visible size difference with the 15" isn't huge, but believe me, I worked for a couple of weeks on a 13" and I wish that I had the 15" then. 3/ I suspect that people who want a 17" have particular needs and are OK with the size and weight trade-offs, so I won't cover it much here. Memory (RAM): The default 4GB of memory should be sufficient for most people. You can always opt for 8GB, but I found that to be overkill, even for my desktop PC (read “context” up there). If you can upgrade the memory modules yourself, it will save you a load of money - again, check what Apple’s policy is in regards to user memory upgrades. Hard disk size: you should be able to know what storage capacity you need, but in general, if the computer will be your main computer, you might want to consider 320GB as a minimum. If you can afford a 7200rpm hard disk, it's even better for the system performance. Hard disk speed: Often, the single most important boost in overall *perceived* performance is the SSD drive (system responsiveness, boot time...). If you can tolerate the lower capacity, you will be rewarded by a snappier, more responsive computer. Apps will load faster, files will open faster, folder browsing will be faster too. In short, life is good. Which processor? : Unless you want to compress video or do something very compute-intensive, I would recommend getting the Core i5 model (you don't have a choice for the 13" and 17" versions) to get the best bang for the buck. The Core i5 will be plenty fast for the overwhelming majority of apps that are not optimized for using many cores (most apps are like that). With that saved money get the SSD drive or more memory (in that order). Core i5, is a great choice for most people. Macbook Pro 13" (Value): If you decide to go for the 13", take a good look at the $1199 one. I think that the extra 0.260Ghz and 70GB in disk storage are not worth the $300 price difference in my view. If you don't need the extra storage, go for the SSD. My recommended Macbook Pro 15 ($2249): This configuration should work for those who don't need more than 128GB of storage. If not, replace the SSD by a 7200rpm mechanical drive, if you can afford it. The new Macbook Pro is a great computer with an amazing world-class design. I think that very few would question how well it is built and how much attention to details went into it. If anything, Mac OS X users who can afford it are damn lucky. If you are one of them, the choice is fairly easy: you simply have to choose between size, speed and price among the few models available. The decision is all yours, but the information up there should help. The timing should be pretty good to, because don't expect any out-of-this-world breakthrough for the reminder of 2010, but we just never say never. For Mac OS newbies, the most important thing is to decide *if Mac OS X is right for you*. I know many people who made the switch for the wrong reason (just because the MBP looks so good) only to regret it later when "work" reality hits and apps aren't quite as expected. If you have decided that you can work with Mac OS X apps, go for it - you will be a very happy user. For the few who want to use the Macbook Pro as a Windows machine, the choice is harder. You could find something that "gets the job done" for much less - there is no question about that - but with an inferior (often, by far) design. Despite what the Mac naysayers might tell you, it's actually not easy to find a PC that can be a Macbook Pro substitute (please drop contenders in the comments section). The HP Envy15 looks like a cousin of the Macbook Pro, but the battery life is abysmal. As of now, the Core i7 Sony Vaio Z is the only laptop that could be a serious contender (read our Vaio Z review). 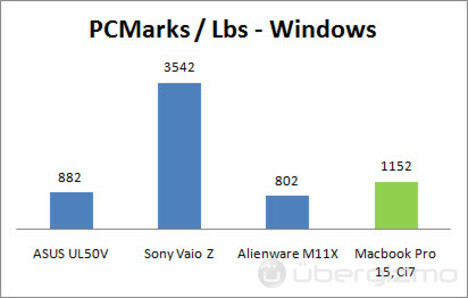 It has a performance/lbs ratio way ahead of any Macbook Pro, but it won't possibly provide the comfort of a 15" Macbook. Like this review? Become a Fan on Facebook.